Hey HHSFC Fencers and Fencing Families! Some of you have asked if you can pay your membership fees online, and at the time we didn’t have anything set up to take credit card payments. However, that has changed! I’m happy to announce that our store is now open! You can pay for your membership fees and for a couple of other items by using our online store associated with our Teamapp site. At the moment, we have the club t-shirt and the team uniform patch for sale there. We may be adding a few more items depending on interest, so keep checking back to see if we have anything new for you. If you would like to see something added to the store (equipment? uniforms? team jackets?) please let me know as soon as you can. To view the store, go to: https://www.teamapp.com/clubs/5364/store. The site may require you to login or sign up if you’re not already registered. For students, if you have already turned in a completed registration form, use the email address that you listed on your form. Any questions, just let me know! This entry was posted in Club Business, Equipment and tagged fencing gear, High school fencing, membership on September 25, 2016 by A.B. Schafer. It’s a new season for fencing, and our new registration forms are available now. Download the forms, and if you have any questions on anything, just let me know. I’m looking forward to seeing our new team! This entry was posted in Club Business and tagged competitive fencing, High school fencing, membership on September 15, 2016 by A.B. Schafer. Hi All! Attached here are the new registration forms for our upcoming season of fencing. You should be able to download the forms by clicking on the link provided below, but if you should have any issues or difficulties, please contact me. I’m looking forward to seeing everyone again, and meeting some new HHSFC members! This entry was posted in Club Business and tagged High school fencing, membership on October 20, 2015 by A.B. Schafer. It’s hard to believe that we’ve completed another season. Thank you for another great year of fencing at Harrison! It’s always a fun challenge for me as a coach, and I hope that you found the lessons and practice sessions fun and challenging as well. I’ve enjoyed working with all of the fencers at Harrison, and I’m already looking forward to next year. To help me plan for the new season, I could use your help. Starting with the last season, Harrison fencers complete a survey that asks questions about the program and how everything worked out for each of you. I need you to complete the survey (online) for this year’s results. Your feedback is very important! It gives me the information needed to make any changes or improvements needed, and it helps me to inform the Harrison administration (Mr. Remaly, Mr. Galema, Mr. Burkle, etc.) how we’re doing and to plead our case for the next year. The survey is anonymous so you can be as candid as you like. I encourage you to share any comments or concerns you may have. And if you have something to share about what you liked, please do so! As always, if you have any questions on anything, please do not hesitate to ask. Thanks again, and I hope to hear from you soon! This entry was posted in Club Business and tagged High school fencing, members, membership on May 16, 2015 by A.B. Schafer. It’s that time of year when high school fencers from all round the Midwest face off in the area’s largest non-USFA tournament for fencers in grades 9-12. We’ve already discussed equipment requirements and costs (see the last post on our Teamapp News screen). Included here in this post is the permission form for participating in the tournament. Please download and print it and have your parent or guardian sign in it. Return the bottom portion of the second page to me at practice this week. This tournament is recommended for fencers who have previously competed in some other competition. If you have not yet fenced at an official match or tournament, please discuss this with me before registering for the tournament. I don’t want to discourage anyone, but this particular tournament could be overwhelming to the brand new fencer. If you have any questions about competing at this tournament, please don’t hesitate to ask. This entry was posted in Club Business, Tournaments & Competitions and tagged competitive fencing, Culver Academies, High school fencing on January 10, 2015 by A.B. Schafer. We will resume our regular practice schedule on Tuesday, January 6. If you have friends interested in learning about fencing, invite them to a practice. It’s never too late to join! January opens the season with big tournaments for high school fencing. If you are interested in competitive fencing, this is the month for you. The Midwest High School Open is scheduled for January 17 at Culver, however the registration page is not yet on AskFRED. Registration fees are usually between $20 and$25 per fencer. The Indiana Middle and High School Championship is also typically scheduled in January, however this also has not been posted on AskFRED yet. As soon as any of the information becomes available, I will forward it to everyone. If you are not familiar with or have not registered a profile with AskFRED, read our previous post, Getting Ready for Competitive Fencing. If you have any questions about AskFRED, just let me know. You should already have all of the basic gear which we use for practices. If you do not have all the competition gear required, I may have some that you can borrow, depending on sizing and availability. I have a limited number of knickers, lames, body/mask cords, masks and electric foils. So if you intend to compete but need to borrow equipment, you must let me know in advance what you will need and for which event(s). Equipment will be available on a first come, first serve basis. Email me your requirements with sizes and any other information. If you would like to save some money on a new mask for competition, consider an easy mask upgrade by getting the retro fit lame bibs which adhere to your current mask. Check with your equipment vendor for the correct size for your mask. 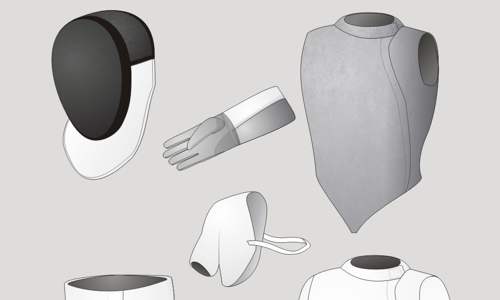 For example, if you bought your medium-sized mask from Absolute Fencing Gear, you can order the medium-sized retro fit bib for $13. Add a mask cord for $6.50 (from Absolute Fencing Gear) and your mask is ready for competition. This is a significant savings since it would cost $55-$70 for a new mask already fitted with a foil bib. (These price quotes do not include any of the club discounts that we get from some of the equipment vendors.) If you have any questions about equipment, do not hesitate to ask. I’d rather that you got the right equipment the first time you order it rather than go through the frustration and added expense of returning/exchanging equipment. As always, if you and/or your parents on competitions and equipment, just ask. Looking forward to seeing everyone at practice in the new year! This entry was posted in Club Business, Equipment, Tournaments & Competitions and tagged equipment, fencing gear, High school fencing on January 1, 2015 by A.B. Schafer. A San Francisco cable car holds 60 people. This blog was viewed about 2,400 times in 2014. If it were a cable car, it would take about 40 trips to carry that many people. This entry was posted in Club Business and tagged fencing blogs on December 31, 2014 by A.B. Schafer. As we discussed in practice recently, our first official fundraising activity for the season will be to sell Ghirardelli Chocolates. (This will be the first of a few activities that we will doing to raise money for the club.) If you’re not familiar with Ghirardelli, they are one of very few American manufacturers that make chocolate from the cocoa bean through to finish products. They sell a number of chocolate products, from squares and bars to hot cocoa and baking products. I’ve received the order forms and posters for the campaign, and I will hand these out to you at our next practice on Tuesday, November 18. We have a group goal and individual goals for this campaign, all of which we will discuss at our next practice session. Remember, all of our fundraising efforts are for hosting our own fencing tournament in the spring. We have some work to do, but getting a head start on all of this will help us to reach our goal. If you want a look at our fundraising brochures, you can download a copy of one of them from this link: Ghirardelli Holiday Brochure. And if you’re feeling really ambitious, you can line up some sales before you pick up your official brochure this week. This entry was posted in Club Business and tagged fencing gear, fundraising, Ghirardelli Chocolates, High school fencing, members on November 16, 2014 by A.B. Schafer. The Harrison Fencing Club has been invited by the Lowell High School Red Devil Fencing club to compete in the RDFC Pre-Season Invitational on Saturday, November 8. The tournament will be held at the Lowell Middle School Gym in Lowell, Indiana, and events start at 8:00 am. Given the relatively short distance for travel and small field of competition, this event is ideal for beginning fencers who want to a “taste” of what competitive fencing is like. Yet, it will still be a challenge for returning fencers. The schools in the Great Lakes Conference have always trained tough, smart fencers. If you are considering competitive fencing but are unsure, talk to Coach about your interests and concerns. There is a fee for competitors but no charge for spectators. The cost will be $20 per fencer per weapon fenced. Also, this tournament will require foil bibs (on masks) for foil fencers. If you do not have a mask with a foil bib, don’t worry. We will discuss an inexpensive option at practice along with any other equipment requirements. I will be asking for parent volunteers to help with transportation. For those of you who will not be competing, you can tag along to support your teammates as long as we have enough room for those fencing and their equipment. I should have a better idea of how many seats we’ll have available by the week of the tournament. Bring snacks, beverages (lots of water! ), and a lunch or cash for concessions. If you know that you’re ready to participate, you can get registered for the tournament by going to the AskFRED site. The tournament link is https://askfred.net/Events/moreInfo.php?tournament_id=28059. If you don’t have a membership to AskFRED (it’s free) , read our post, Getting Ready for Competitive Fencing, to learn how to register for a membership. This entry was posted in Club Business, Tournaments & Competitions and tagged épée, fencing gear, foil, High school fencing, Lowell High School, Red Devil Fencing Club, sabre on October 25, 2014 by A.B. Schafer. I will be placing the first club equipment order on Tuesday, October 21. If you would like to order any equipment, please have your order and money ready for on by practice on Tuesday. For those of you considering competition, there will be a few events where a lame bib will be required on your mask (foil fencers). If you have any questions about equipment, contact me as soon as you can with your questions. This entry was posted in Club Business, Equipment and tagged épée, equipment, fencing gear, foil, jacket, mask, sabre, starter set on October 19, 2014 by A.B. Schafer.